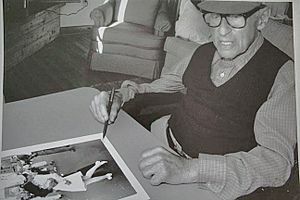 Alfred Eisenstaedt (6 December 1898 – 24 August 1995) was a German photographer and photojournalist. He is renowned for his candid photographs, frequently made using a 35mm Leica M3 rangefinder camera. He is best remembered for his photograph capturing the celebration of V-J Day in Times Square. Eisenstaedt photographing the Clinton family on Martha's Vineyard. Alfred Eisenstaedt Facts for Kids. Kiddle Encyclopedia.